Children and pregnant women are at the highest risk from lead exposure. Lead can cause premature births, reduce birth weight, delay physical and mental development in babies and young children, and can have an effect on learning abilities. In adults a build up of lead in the body can cause kidney damage, anemia and damage to the nervous system. Over a lifetime of exposure high levels of lead can cause strokes, kidney disease, and cancer. There are no known health benefits from exposure to lead. Where does Lead in My Drinking Water Come From? Lead is a toxic heavy metal found in mineral deposits in the earth’s crust. Lead is not commonly found in our drinking water but can enter the water supply from the corrosion of pipes, lead in solder and lead used in the manufacture of some pipes and brass plumbing fittings. Soft Acidic water is mildly corrosive and can dissolve lead from pipes and solder into the water. Lead was used in many plumbing pipes, faucets and solders prior to 1986 when lead was banned from use in plumbing materials. Some older houses built prior to 1930 had lead pipes used as the water service pipe into the house. The US Environmental Protection Agency(USEPA) estimates that approximately 20% of our lead exposure comes from our drinking water. How do I Know If There is Lead in My Plumbing System ? If your house was built before 1986 and you have copper water pipes then chances are you have solder which has lead in it. Also prior to 1986 faucets had lead added in the manufacturing process and same for Brass plumbing fittings even if not soldered together. 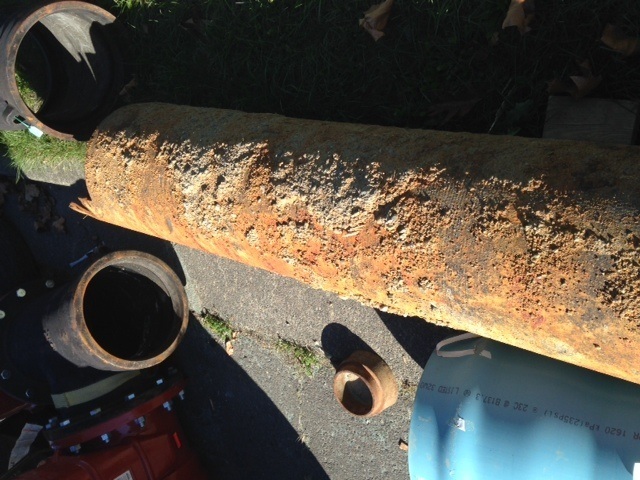 If your house was built prior to 1930 there may be a chance your water service pipe is made of lead, your water dept should be able to verify this for you. First you may want to take a sample of your water to a local lab and have it tested. If you live in a house built prior to 1930 you may want to call your water supplier and ask if you have a lead service pipe, or you can look in your basement where the water line comes into your house and see what material your pipe is made out of. If it is lead it will be a dull grey in colour much like the look of a fishing weight. If you determine that you have a lead service pipe you should arrange to have it replaced as soon as possible. If your house was built prior to 1986 and you determine you have copper pipes I would not suggest you should change these pipes. You can open your cold water tap first thing in the morning and let run for 5 minutes to flush the lead out. Lead gets absorbed into the water as the water sits overnight in your pipes, so if you let it run for 5 minutes you will get a lot of the lead out. A better solution is to install a filter system that removes the lead from your drinking water and use this lead free water for drinking and cooking. If you have lead in your system never use hot water for cooking as the hot tap water will have a higher concentration of lead than the cold tap water. The best solution is to install a Mineral Pro Reverse Osmosis system. Our RO system will remove the lead, chlorine and many other contaminants that could be in your water. 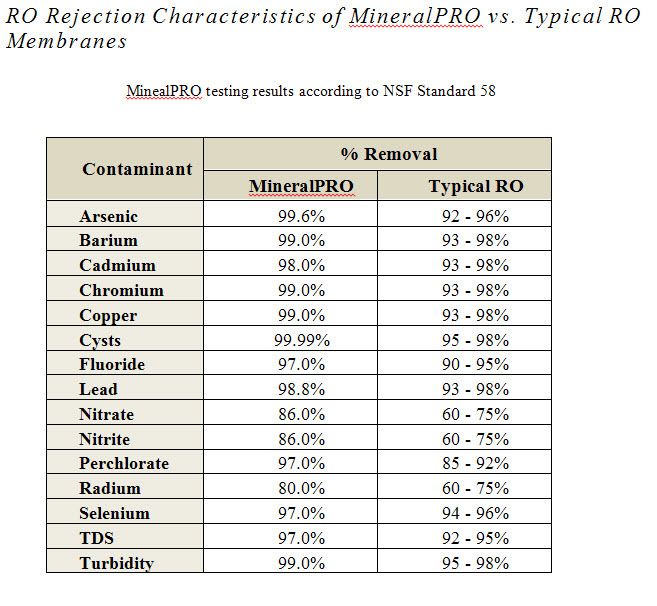 In independent testing MineralPro RO membranes consistently removed more toxins than typical RO systems. If you are only concerned with removing the lead then Mineral Pro has several options for very affordable single stage Lead and Chlorine Removal. Even if you live in a rented house or apt Mineral Pro has a Countertop Lead/Chlorine removal you can connect onto your existing faucet, no holes to drill in your sink or permanent connection. Lead in water supplies is a real and present problem in many areas of North America, in many cities with older infrastructure and in houses over 80 years old. At MineralPro we think its vital to know that the water you get direct from your kitchen tap is safe. No boiling, bad taste or unknown chemicals to concern yourself with. All that peace of mind when things are not so clear about your municipal water supply PLUS the enjoyment of the best tasting water you can imagine and all the health benefits of clean filtered mineral water.